Ben Keeline talks about his struggles with poker that almost caused him to quit before winning the WSOP Colossus II. 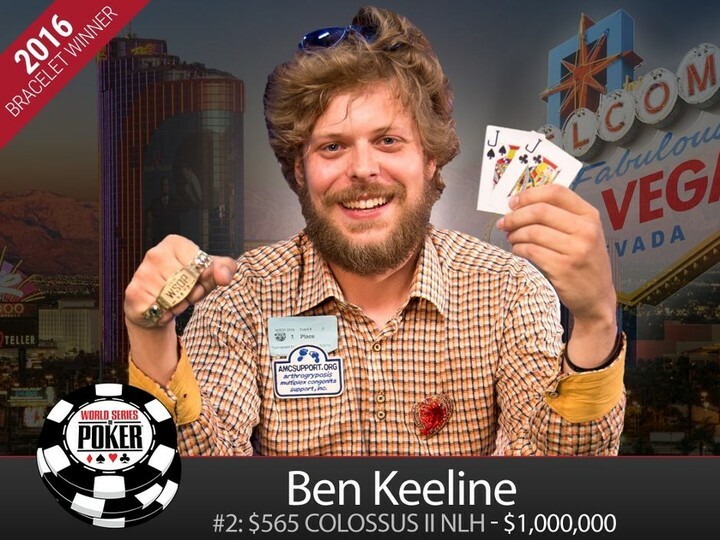 Winning $1 million earlier this week in the 2016 WSOP $565 Colossus II No-Limit Hold’em event, Ben Keeline has since revealed that he almost didn’t even go to the World Series of Poker this year. In an interview following his win it was revealed that Keeline had recently become an Uber driver and was dropped by a backer earlier in the year. His father had to laon him the money to come out to the WSOP this year. “The two biggest scores in my life have come at my lowest points,” Keeline told reporters. “I’ve had a really hard time lately, and I’ve just tried to stay positive. I can’t believe it. It’s an amazing feeling. I’m elated. It’s unreal. A huge congrats to Ben! You can check out more of the intervew with Ben in Noaln Dalla’s writeup on WSOP.com here. 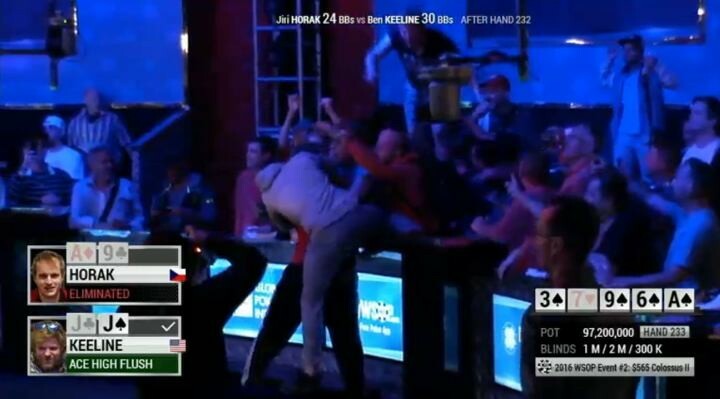 As the tense final moments of the head to head match between Jiri Horak and Ben Keeline in the 2016 WSOP $565 Colossus II came to a close, the river card on what turned out to be the final hand sent both men’s supporters into a celebratory frenzy. Watch the final moments here (scroll to the end of the video) as Horak’s supporters hug him and congratulate him—when in fact Keeline had won the title with a spade flush bagging the $1 million in prize money. Talk about that awkward moment. He however graciously, sought out Keeline to congratulate him when he realizes his mistake. As a result of his 1st place finish this week, he now gets to choose the name for his soon-to-be-born baby. 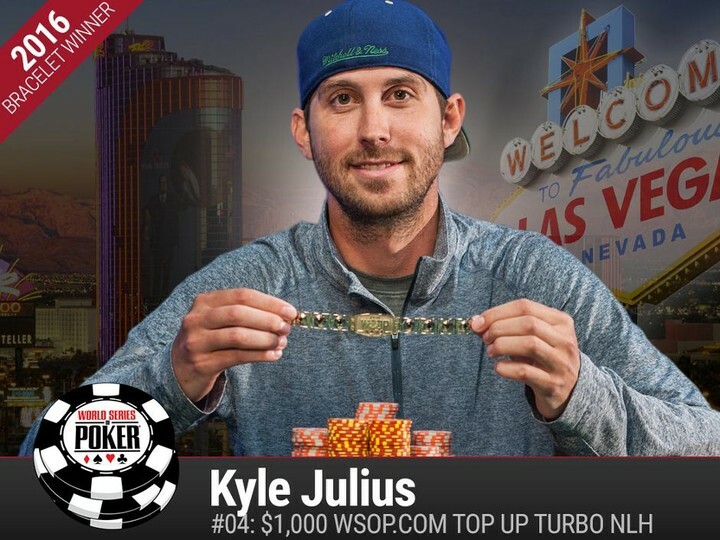 Winning your first ever WSOP bracelet must feel like victory enough, but Kyle Julius also won a bet with his fiancé who said if he won a bracelet he could name their child. “We’ve been arguing about names and my fiancé was like ‘Alright, how about this: if you go out and win a bracelet you can name the kid’”, Julius explained. Julius won his bracelet in the Top Up Turbo Event on Monday. His $142,972 winnings should go some way in covering the cost of diapers. You’ve got to check out Joe Ingram's latest Poker Life Podcast with Olivier Busquet. Don’t be deceived by the title: “Discussing $300k SuperHighRollerBowl with Olivier Busquet”—because it ends up with the pair often in hysterics, covering a whole host of topics and a lot of p*ss taking. Sam Abernathy and her cat Binks end up being on the show and Busquet had some really interesting things to say about the controversy surrounding Poker Night in America. Appointed, in what the WSOP called their first ever “Twitter Czar,” Kevmath has taken over the reigns of both WSOP and WSOPcom twitter accounts and we are glad to see that the new role hasn’t gone to his head. As well as updating his twitter followers on his latest killer outfit choices, he will be answering questions and updating everyone on all the tournament action. 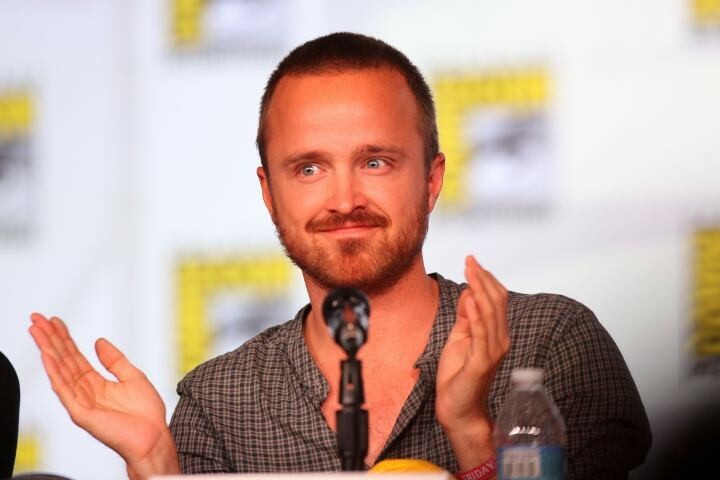 Aaron Paul’s first outing for LA Sunset against Paris Aviators’ Fabrice Soulier couldn’t have gone better—with him beating Soulier 2-1. The Cube also made its debut yesterday but I am witholding judgement on the viewers experience until I see it in all its glory in a stadium setting. Tonight the Summer Series progresses with San Francisco Rush and the Moscow Wolverines taking to The Cube. He’ll be representing the LA Sunset in the latest match against the Paris Aviators. 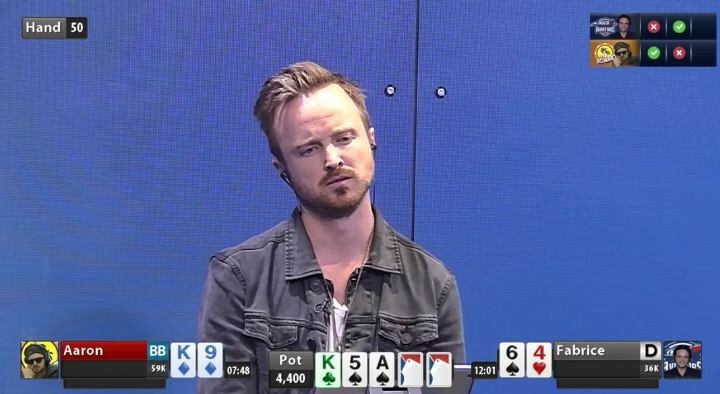 Playing live from Las Vegas tonight, Breaking Bad’s very own Aaron Paul will be representing LA Sunset for the first time as the Global Poker League moves to its Summer Series portion of the schedule. Pressure will be on Paul as his selection has caused quite the stir in the Poker community. Paul is expected to be live streaming his match today on Twitch —it’s unconfirmed whether it will be from The Cube. LA Sunset currently sits at number two in the Americas standings with the Paris Aviators behind at fourth over on the Eurasia standing—nine points total behind LA Sunset. 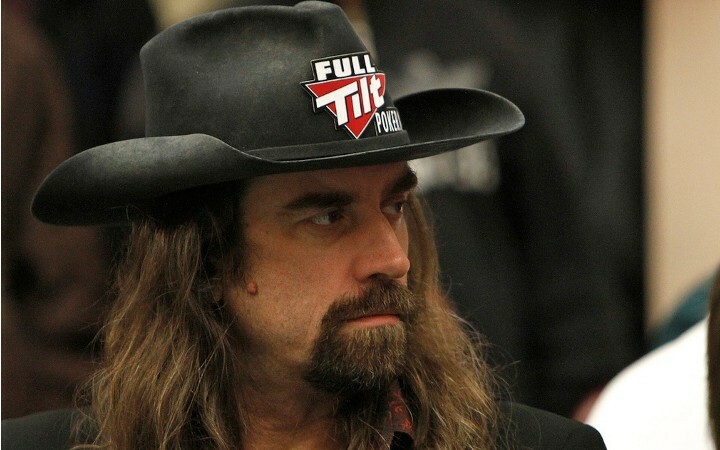 Setting foot in The Rio All Suite Hotel & Casino in Las Vegas for the first time since Black Friday in 2011, ex Full Tilt Poker exec, Chris “Jesus” Ferguson entered the $10,000 Seven-Card Stud Championship in this year’s World Series of Poker. Ferguson’s appearance comes shortly after Howard Lederer finally issued a public apology for this handling of the Full Tilt Black Friday crisis through Daniel Negreanu’s blog. The $10,000 Seven-Card Stud Championship finishes later today with Ferguson not making the cut. The Final table looks like this, with Robert Mizrachi firmly in the lead.